2.27.15 – The Free Press – The Complete Streets Plan and Policy, along with connectivity and wayfinding opportunities in and around the City Center were reviewed by the public. See Full Story. 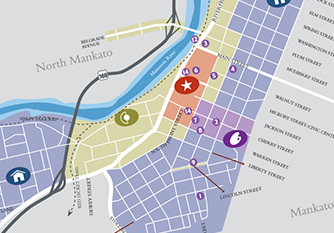 2.18.15 – KEYC TV – The City Center Partnership and city of Mankato are partnering to gather feedback from the public on the Complete Streets Plan and connectivity opportunities within the City Center and greater Mankato. See Full Story. 7.29.14 – Developers Agree, City Center Mankato is the Place to Live, Work & Play!